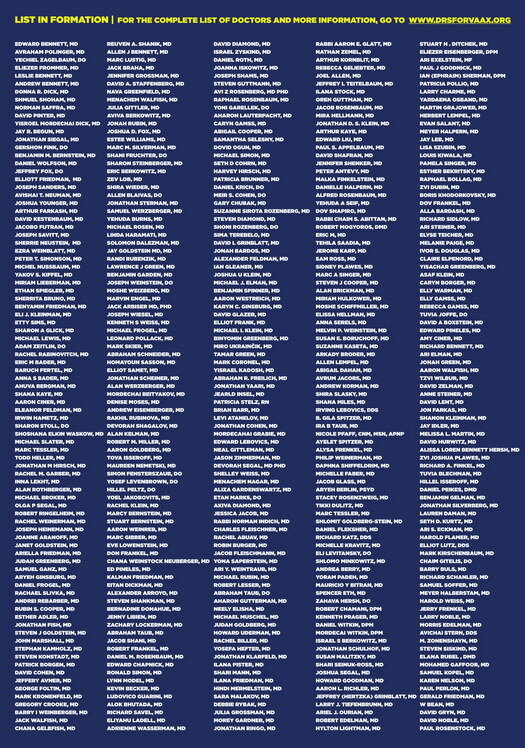 In what can only be described as unprecedented, over five hundred doctors representing numerous Jewish communities across North America have signed a letter confirming the need for all children and healthy adults to get immunized, according to the CDC schedule. 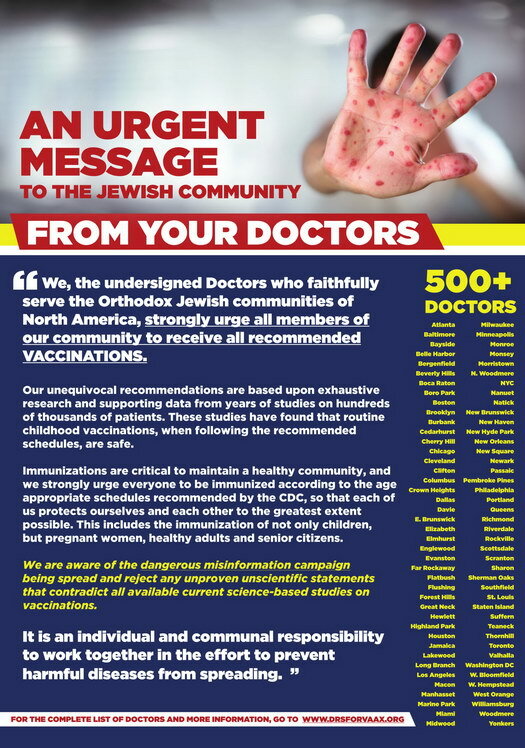 This mass declaration by medical professionals, likely the first of its kind addressing the broad Orthodox Jewish communities nationally, directly and starkly calls out the dangerous falsehoods being spread by so-called anti-vaxxers. 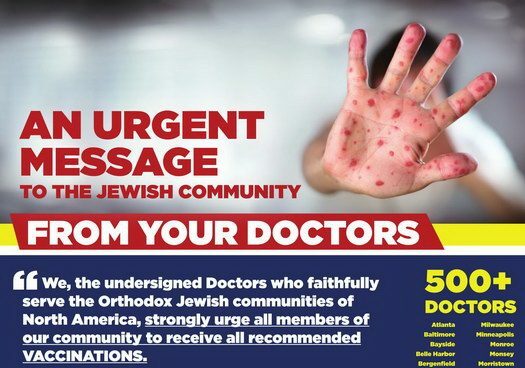 What makes the statement that much more important is that it comes at a time when Jewish communities are battling not only the potential for a measles outbreak in their own backyards, but also the false perception that Orthodox Jews do not vaccinate. Indeed, statistics issued by the NYS and NYC Health departments confirm that in fact the overwhelming majority of Orthodox Jewish children are vaccinated, and the doctors in this letter are clearly aiming their unequivocal recommendations to the small percentage of people who have refused to inoculate themselves and their children from dreaded illnesses like measles, mumps, rubella and other diseases, at the expense of the larger community. 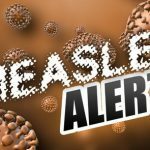 Doctors and Askonim are also increasing efforts to inform adults in the wider community to check their own existing immunity levels, because many adults are under the impression that they are properly protected when in reality their childhood immunization may no longer be effective due to a wearing off of the vaccine. 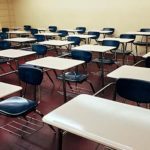 Doctors are fearful that this is a potential danger to thousands of unsuspecting individuals. 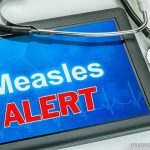 “With the measles outbreak now hitting communities like Detroit, and Baltimore and still very active in Rockland County and Brooklyn, the need to protect ourselves and each other has become of paramount concern” said Dr. Edward Bennett a popular emergency medicine physician from Queens and an original sponsor of the letter. Dr. Bennett continued, “people think they are in the clear because they were vaccinated as children but unfortunately we are seeing numerous cases of healthy adults born in the 1960’s, 1970’s and 1980’s who are now taking their titers test, a blood test to measure immunity, and coming back with negative immunity to one or more of the diseases. This requires an immediate booster shot.